We do not have details about this building's place in time but from its appearance it is clearly of a similar design, only larger, then the late twenties Melfort buidling. Using Estevan brick to create the building's exterior and triming it with limestone makes this a striking and substantial sort of building. The 1950s name splashed on this structure like that on Melfort's court house detracts from the purity and tone of the governmental authority that seems to come from the building. 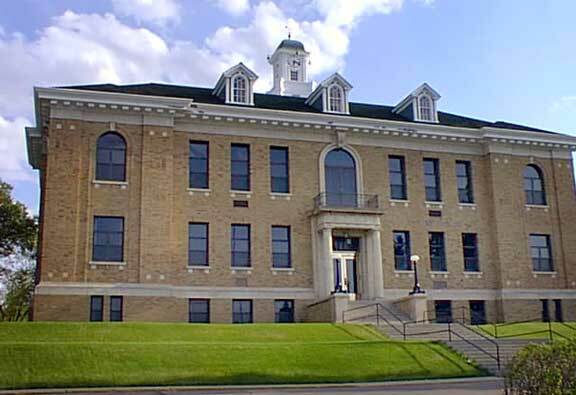 This beautiful court house is situated as the land rises away from the central business district of Prince Albert with Mainstreet stretching to the North and ending at the Saskatchewan River. The street splits and goes around the building as can be seen (above right) as we look at the building from its South side so this one faces North as we look from its main entrance in the picture on the right. In addition to the clock tower on the roof, there are three doorways poking out of the roof and the one on the extreme right appears to function with what appears to be entrance hardware. 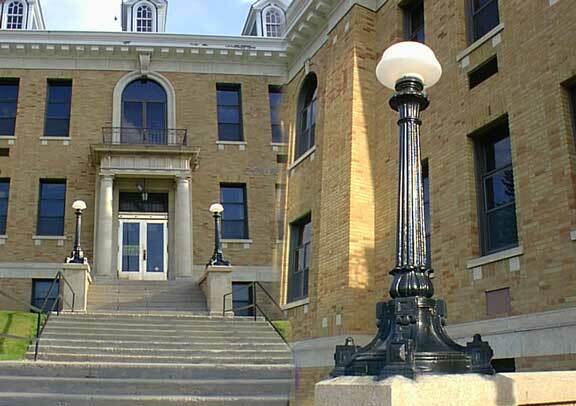 This picture above shows the stretching rising stairway up to the main entrance flanked by two columns and these interesting cast iron light standards. These Victorian styled lamps look much like what we might see in Ottawa or in London. Looking up from the door way (above left) we can see the ornate detail of this portico and plastic owl set there to deter swallows from building nets. 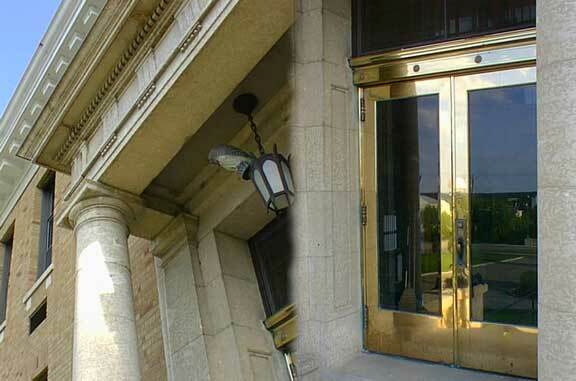 The doorway itself is this magnificent brass frame and doors. Despite the grandness of the stairway it is made from aging concrete which is showing some serious damage from salt and years. The right side of this picture shows the bars on what are likely cells in the basement . The image (below left) is what you see when you enter the Prince Albert court house with the marble floors and oak trim all in the same quality as the Melfort building but in this larger and grander building there is a clear sense of impressive wealth that was so much a part of the 1920s. The remarkable commemorative statue in front of the building was cast in 1926 to stand for the First World War memorial and was created in London. 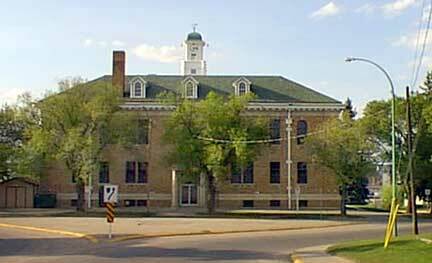 It is therefore likely that the Court House was built on or about that same year. 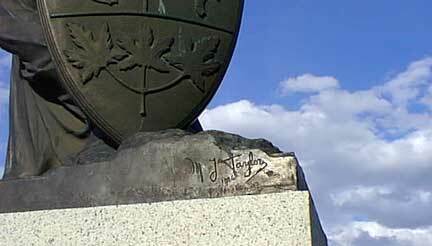 The statue is an excellent example of the work done at the time and bear's the artist's signature as can be seen below. 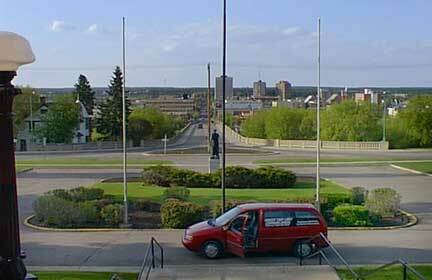 The shield of course is that of the province of Saskatchewan. When you look at this outstanding example of a public building and consider all the history that has been made within its walls, the problems solved, the issues debated and decisions rendered, there is a realisation of the importance we place in having a civilised and orderly way of settling disputes. 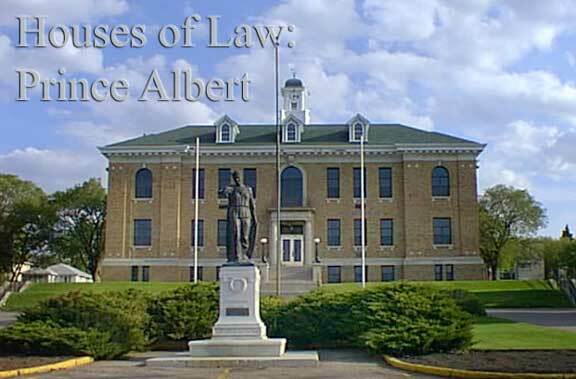 Situated in Prince Albert, without a doubt many times John G. Diefenbaker would have represented clients in this building as he toiled away as a post World War I solicitor. Diefenbaker had been injured during an air raid in London during the first war and as a result was sent home and was thus not a victim of the calamity of that great conflict. How disappointing it must have been to have to add the brass plaque to this marble base of this monument. Carved in the marble are the words "the great war" and just below it the plague for World War II.